There are many types of ways to raise finance for your business, but choosing to go unsecured or secured with a business loan can be a difficult decision. At capalona.co.uk, we have created a simple infographic to help business owners compare some of the main differences between these two funding options. Unsecured Business Loans does not require any business collateral. This option may be suitable for businesses who don't have any assets to secure against. It can be faster to obtain, however, the disadvantages of this type of lending include smaller loan amounts and higher borrowing costs as it presents more risk for the lender. 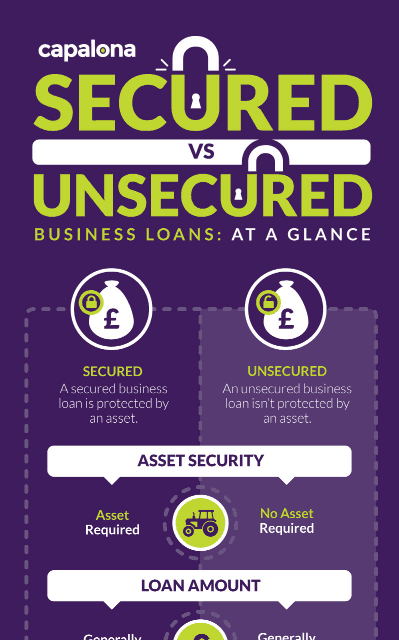 A secured business loan is secured against assets like machines, vehicles, equipment or property. Security means that you will be able to borrow a large amount with lower interest rates over a longer term. However, the disadvantages include your loan amount as this will be based on the value of your asset and the risk of losing it if you can't make payments.